Whether it’s coming out as lesbian, gay, bisexual, transgender, queer, or as an ally, countless actors, athletes, musicians, politicians and YouTube sensations have helped advance the movement for equality. In honor of National Coming Out Day, which we celebrate each year on October 11, here are a few of the standout coming out moments in pop culture from the last year. Singer, songwriter, rapper and actor Janelle Monáe revealed in April of this year that she identifies as pansexual. “Being a queer black woman in America… someone who has been in relationships with both men and women – I consider myself to be a free-*ss motherf*cker,” Monae told Rolling Stone in an interview. In August 2018, actor and 2018 HRC Visibility Award recipient Josie Totah came out as transgender in a powerful op-ed for Time. Totah explained that watching transgender teen and former HRC Foundation Youth Ambassador Jazz Jennings live her journey to her authentic self on television was powerful for her. HRC was proud to honor the young trailblazer with the HRC Visibility Award at the 2018 HRC Salt Lake Gala. https://t.co/Ltz8ttemoB For so long I’ve been trying to hide who I was. And I did it in fear. In fear that I wouldn’t be accepted or loved. I know now more than ever I’m ready to take the step to becoming myself. I am Transgender and this is my story. Actor Rutina Wesley announced her engagement to her partner on Instagram. HRC was proud to present Wesley with the Visibility Award at the 2018 HRC Louisiana Gala Dinner. Actor Tessa Thompson came out as an LGBTQ woman in June. “I’m attracted to men and also to women. If I bring a woman home, [or] a man, we don’t even have to have the discussion… I want everyone else to have that freedom and support that I have from my loved ones,” Thompson said in an interview. Singer, songwriter and dancer Kehlani came out as queer in November 2017. Questions about Kehlani’s sexuality come to light when she released the song “Honey,” in which she talks about a relationship with another woman.
.@HRC is proud to honor openly queer singer, songwriter and dancer @Kehlani ahead of #NationalComingOutDay. Actor, singer, dancer and model Alyson Stoner came out as a member of the LGBTQ community through a powerful March Teen Vogue op-ed. Canadian hockey player Jessica Platt came out as transgender in a heartfelt Instagram post in January. Popular Instagram model Reece King came out as bisexual in early 2018. King opened up about his sexuality and biphobia in an interview with the Gay Times. Visual and performance artist Zulfikar Ali Bhutto came out as queer in a video for the “The Turmeric Project,” which features LGBTQ South Asians living in the U.S.
“People think you’re either queer or you’re Muslim, and that somehow those two things are in opposition to one another,” Bhutto said of the negative reactions to his coming out story. Georgia Rep. Renitta Shannon used the eve of 2017 National Coming Out Day to come out as bisexual, joining several other openly LGBTQ state legislators in Georgia. In a powerful video, YouTuber Elle Mills came out as bisexual in November 2017. In an October 2017 interview with The Sunday Times, singer and songwriter Sam Smith opened up about gender identity and came out as non-cisgender. “I don’t know what the title would be, but I feel just as much woman as I am man,” Smith said. YouTuber and social influencer Jessie Paege came out as bisexual in a pair of videos in June. 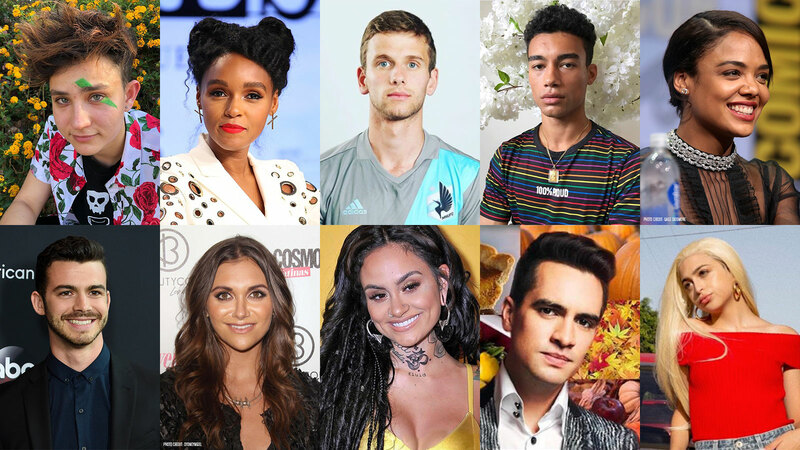 Paege continues to use her platform to advocate for LGBTQ people, including teaming up with HRC in an exclusive video to encourage people to turn out and vote in the midterm elections. In October 2017, John Kim, the captain of Virginia Military Institute’s swim team, came out as gay and received immense support from his teammates and community. Kim’s inspiring story featured its struggles, including enduring the social pressures that prevent many people from coming out. “After coming out, I can now live fully by the motto: Be you, be authentic and have fun doing it,” he wrote. In an April essay for Outsports, Venezuelan Olympic diver Robert Páez came out as gay. After gaining Canadian citizenship, Ugandan rapper Keko come out as lesbian. Keko won 2016 Female Artist of the Year at the Uganda Hip Hop Awards. In January, professional ice skater Matt Evers came out as gay. “I live my life by example, and I want to show young people that what you feel or how you were born isn't something bad,” Evers said in an interview with Attitude. R&B artist Terrence Stone, formerly known as Aaron Thomas, came out as bisexual in an interview with Philadelphia magazine in January of this year. “One of my biggest inspirations behind my coming-out story is my ex-boyfriend James… He taught me a lot about myself,” Stone said. Tennis star Alison Van Uytvanck announced that she identifies as gay after rising to fame with her 2018 Wimbledon performance. DJ Felix Jaehn, who rose to popularity for his remix of the song “Cheerleader,” came out as bisexual in a February 2018 interview with Germany’s ZEIT magazine. “Now I dream of finding the person I want to share my life with, man or woman,” he said. Actor Lee Pace came out as a member of the queer community on Twitter in March. In an interview with The Advocate, actor Joey Pollari publicly came out as gay, although he noted that he’s been out to his friends and family since he was 18. Pollari stars in Love, Simon, a groundbreaking coming of age movie about a gay teen. In it, he plays one of the protagonists’ potential love interests.
.@HRC is honoring openly gay actor @JoeyPollari ahead of the 30th anniversary of #NationalComingOutDay. Actor Bex Taylor-Klaus came out as non-binary in July of this year on Twitter. Hi. I’m Bex, and the rumors are true. I’m v enby. French olympic kayaker and gold medalist Sandra Forgues came out as transgender in an April interview with French publication L’Equipe. Actor Abbi Jacobson came out as an LGBTQ woman in April 2018 in an interview with Vanity Fair. In April, actor, singer and radio personality Kevin McHale came out as a member of the LGBTQ community. Todd Harrity became the first male professional squash player to come out as openly gay in April 2018. Former University of Kentucky punter Landon Foster came out as gay in a June essay in Outsports, noting that he hopes his story inspires people and promotes inclusion and acceptance in the sports world. Entertainer Brendon Urie came out as pansexual in July. Panic! At The Disco has been an active supporter of HRC in the past, collaborating on a t-shirt to go along with their single “Girls/Girls/Boys” and is has participated in HRC’s Equality Rocks campaign. Air Force football player Bradley Kim made history in 2018 as the first active football player at a service academy to come out. Actor Garrett Clayton came out as a member of the LGBTQ community in a touching Instagram post in August. Professional golfer Tadd Fujikawa came out as gay in September of this year — on World Suicide Prevention Day — making history as the first professional golfer to be openly LGBTQ. YouTuber Andrea Russett came out as bisexual in September, the day before Bi Visibility Day, after her best friend made anti-LGBTQ comments to Russett and her LGBTQ friend.